Two . The number that comes after one. The number that is neither an odd nor an even number. It seems just like it was yesterday. Or a few hours ago. The day we were all brought to our knees and our palms touched the soft ground beneath us. On that day, the whole country was shaken. Shaken in a way that each one of us would remember that day for ages to come. Or will we? I’m talking about the 2nd of April 2015.Our beloved nation was once again gripped by the deadly jaws of terrorism. On that day, I was somewhere in Machakos County, at the main Nairobi-Mombasa highway waiting for the bus to arrive and take us to Mombasa-my home place. It was around 8PM and the cold on that day was unbearable. I was seated on the cold booking office metallic seats, with my high school results in my small bag which was dangling on my shoulder. I had absolutely no clue that a major catastrophe had occurred. Then these two middle aged men came into the booking office.”Students! They were just students! What could have students done to them to deserve that…And they say they are doing God’s work…”Their conversation struck me. I sat upright, beaming with curiosity, to get every bit of detail on what they were talking about. I eavesdropped their conversation as they booked their tickets to Kisumu. Surprisingly, people started contributing to the story of the two men. The quiet booking office, within minutes, was turned into a chatter room. And there I was, a clueless teenager who has no idea what was happening in his own country. I immediately took my phone, whose low Battery red light was beaming unceremoniously on my pocket. I didn’t care. I had to know what was happening. I switched on my mobile data and clicked the Google icon. ‘Students attacked ‘. I typed just that. I mean honestly, was I supposed to ask around what had happened. People would be amazed how one has not heard such hard-hitting news. No need to look stupid, right? So anyway, the Google results came and Boom! You know that feeling when you are punched on your stomach and you suddenly become numb and you are left in shock. Reading that 147 students from Garissa University were brutally massacred by militants made me breathless. And it happened in the wee hours of the morning. All this time I had no clue at all that a catastrophe had befallen us. I was just lost for words and thoughts. Reading the survivor’s accounts of events in that morning and trying to imagine how horrified they were and those they would live with that trauma for a very long time. It was just hell. My journey that day was off mood. There was nothing I could do but still I felt it. As each and every Kenyan felt it on that day. The news was on everyone’s mind for the better part of that month. Condemnation followed soon. Promises of swift justice to the perpetrators of the heinous act were heard all over the media. Tight security measures were implemented all over the country. It was on each Kenyan mind that the national ID was to be your companion and soul mate for the better part of the days to come. I was on one of the days travelling from Malindi to Mombasa. The way our vehicle was scrutinized it was as if the terrorists could be hiding inside the car’s tyres. But as it is said, time heals all wounds. Soon after, the levels of security reduced with time. Two months later, I headed to the coastal town of Malindi once more. Contrary to the normal security routine, we were greeted with waving hands by the uniformed men. It’s just the way it is. Two years down the line. 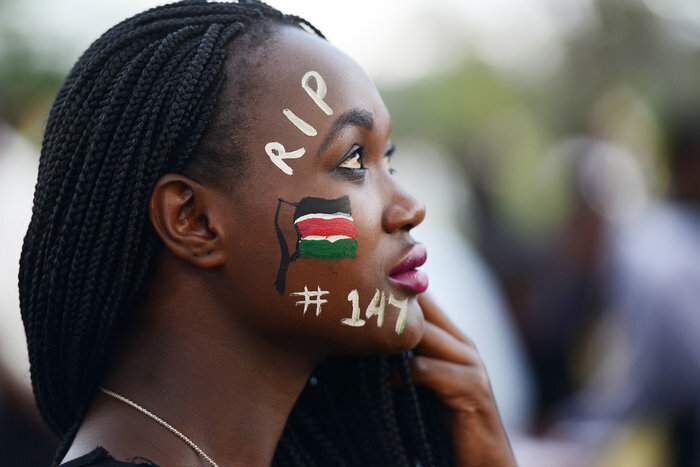 We will always remember the 147 of Garissa. May you forever rest in eternal peace as we recall that bloody day.